CASE STUDY- How Fashion and You lost its No.1 position in Indian fashion e-commerce industry? Home > Blog > Blog > CASE STUDY- How Fashion and You lost its No.1 position in Indian fashion e-commerce industry? What you will find in this case study ? What went wrong? How Fashion and You lost its number 1 position in Indian fashion e-commerce industry? How Fashion and You is regaining its lost glory and making customer’s experience a happy one? What Fashion&You is planning for its Future? On 15 Dec 2009, a website was launched in India that changed the way Indians used to shop for fashion wear. An exclusive and only one of its kind, Fashion and You was launched as “Premier Member Only” discounted shopping website for designer brands with key focus on ladies merchandise. To start off, it concentrated primarily on female merchandise having 80% of its SKU (stock keeping unit) for females only. For the first time, Indian middle class was able to buy leading designer brand products at up to 80% off.Merchandise from various categories like handbags, apparels, shoes, perfumes etc. from the top brands like Diesel, Bossini, Benetton, Aerosoles, Adidas and many more were available at upto 80% off, which led the name Fashion&You go viral among the young educated and working Indians. Watching the success of Fashion&You, soon other people joined the race and websites like 99labels.com, fetise.com, theprivatesales.com were launched as premier member only websites. However by the time Fashion&You established name and fame for itself in online fashion industry and was not feeling any threat from the rival websites. But being a “member only website” meant that in order to access designer label on sale, visitors were required to sign up on the website by giving information like name, email id, gender, contact number, city and only then they were given an access of sale items. To create an agency and increase sales of its products, Fashion&You offered branded items on sale for a limited time period which generally lasts for 3-4 days. Further, the unsold items of the listed brands on Fashion&You were compiled together and were offered at even lower prices. Running on first mover advantage and aggressive marketing strategy made Fashion&You a leader in online shopping category in India especially for females. 1) FashionandYou used affiliate marketing to add advantage to the business and ran cost per lead (CPL) campaigns with many affiliate networks in India like tyroo.com and vcommission.com. The payout being offered to the affiliates was INR 65-70 for getting signup from one female user. This ensured Fashion&You getting 30-40 thousand members only with affiliate marketing. 2) Further, FashionandYou distributed coupons worth Rs 1000 to its registered members in order to acceptance of the invitation sent to their friend via Facebook or email to join Fashion&You . 3) In order to retain its members and make them visit again and again, Fashion&You adopted a digressive email marketing strategy which meant that they used to send email every day to each of their members about new offers for sale. 4) FashionandYou also regularly posted interesting articles on their blogs to increase the awareness and engagement. 5) For any board, search engine marketing plays an important role and FashionandYou being no exception in this category marketed itself well on Google using SEO, Adwords and PPC advertising. 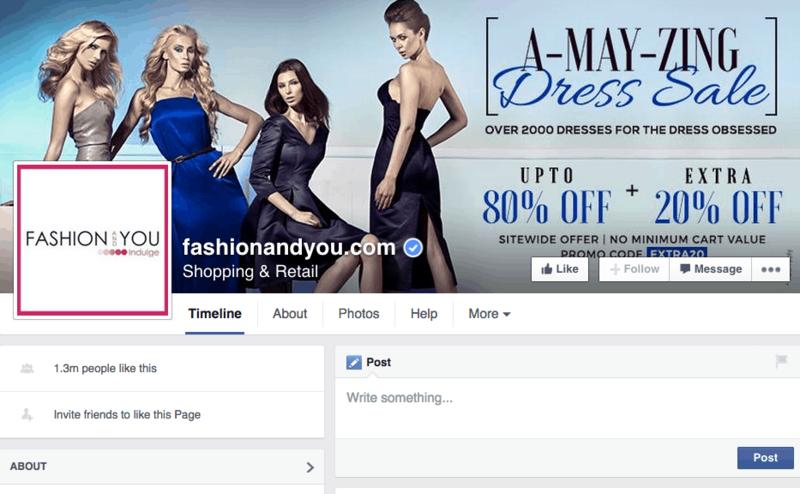 6) Gaining on its popularity, FashionandYou utilized Facebook marketing opportunity very well. Within weeks of their launch, Fashion&You crossed over 1 lacs fan on their fan page. Not being away from ads, FashionandYou also advertise heavily on Facebook targeting primarily female between the age group of 22-35. 7) Understanding the importance of brand awareness and to get new visitors on website, FashionandYou also used display banner advertisement for its advantage. This activity served FashionandYou banner running on several other websites. Something wrong was going inside the company. Not disclosed officially but according to some sources, there was a rift between the top management of the company. In an interview given to Business Standards on October 1, 2012, Harish Bahl openly accepted that his company has done mistakes. He stated “Our Company has made highest number of mistakes”. He also said “we wasted nearly two years only discussing how to go international. But we did nothing”. However there were many other reasons for the downfall of Fashion&You which resulted in losing the No1 position in Indian fashion e-commerce industry. 1) Competition: FashionandYou saw colossal competitions with other e-commerce sites like Myntra, Jabong and 99labels upto some extent. Initially “member only” feature what worked for FashionandYou went against it and sites like Myntra and Jabong started tapping in the market as visitors founded it easier to browse the products without signing up. 2) Having too many options spoiled us and this statement went on to be true for Indian consumers. On one side where Myntra and Jabong were offering products from almost every brand of India, FashionandYou was limited to sell some selected brands only. 3) FashionandYou was doing drop shipping: This meant that they just listed the items on their website without actually having it in their stock. Visitors after buying products had to wait upto 15-25 days to receive the delivery of the product. FashionandYou was dented most when its big competitors started delivering the products within 3-4 days. People founded it really very hard to wait for 3-4 weeks and started turning to the websites that were delivering the products fast. In the process, FashionandYou lost lot of its permanent customers. 4) Dropping Quality: FashionandYou was offering designer products at 80% discount; that meant most of the time, the items which were being offered on sale were from the last season or the one which were lying unsold. On the other hand, other e-commerce websites were offering both fresh and discounted items separately. 5) Management Rift: Things falling apart causes a rift between top management and co-founders which resulted in the situation where two of the co-founders resigned. Current CEO of FNY Mediratta said “There were internal issues after Pearl left and we were looking for a leader. That is when we acquired Urbantouch, but it was a failed acquisition”. 6) Marketing Budget: Decline in sales and higher acquisition cost saw the funding amount being vanished. Hence all of a sudden, FashionandYou was low on marketing budget and as marketing is backbone for any business, FashionandYou kept on declining. 7) Diverted interest of the top management: The initial success of FashionandYou boosted confidence among top management and it was decided to open other e-commerce portals targeting fashion category. Harish Bahl, co-founder of FashionandYou and chairman of Smile group in an interview given in 2011 openly announced the plans to start two new e-commerce ventures in India. Soon bestylish.com and freecultr.com was launched. 8) Affiliate Rejection: Change in trends in Indian e-commerce industry led FashionandYou to keep its “member only” model aside and give an open access to all the visitors. Due to this change, FashionandYou changed their affiliate campaign type from cost per lead (CPL) to cost per sale (CPS) and offered a fixed amount of 8% for every sale to its affiliates.During this time, other competitor like Myntra was offering a fixed amount of INR 500 on every sale to its affiliates. This change in commission saw more affiliates turning to Myntra and Jabong instead of Fashion&You . 9) Private Label: Though FashionandYou “Lead to Sales Conversion” was probably best in the industry at around 4% – 6% but its Cost perAcquisition (cost of acquiring per customer) was very high at around 800-1200 rupees. Hence in order to increase its profit margin, Fashion&You decided to sell apparels under its private in-house brand. It was believed that most of the apparels were imported from China and Thailand. This decision increased the profit margin initially but hampered the brands reputation as the quality of private label merchandise was in no comparison with other designer products that was being sold. [su_box title=”More Case study from DSIM :-” box_color=”#c7c7c7″ title_color=”#000000″ radius=”2″]1) Delhivery: Know how a group of friends stood a business of worth INR 500+ crores? 2) How Yepme.com made a name for itself in competitive Indian e-commerce industry? The company was founded by three members named Harish Bahl, Pearl Uppal and Gaurav Kachru. Where Harish was the investor and CEO of Smile group, Pearl Uppal and Gaurav Kachru were the co-founders of Fashion&You who dedicated their business strategy expertise to boost Fashion&You . Harish Bahl, an Indian Investor acted a lead role in putting the founding of the company. Harish as the founder CEO of Smile Interactive Technologies Group had nurtured many successful leading online businesses like Quasar, Tyroo, Zoomtra and Zumtra. The man has over 15 years of entrepreneur experience in the industry. Pearl Uppal joined the team as co-founder and CEO of the company. She had almost 10+ years of experience in successfully growing the venture in the internet world. Earlier she worked with Yahoo India as Sales Director and Rediff.com as well as General Electric. Pearl quit the company in early 2013 to start her own incubator 5ideas Startup Superfuel along with Gaurav Kachru. Gaurav Kachruworked as the co-founder of the Smile group’s deal site DealsandYou.Gaurav operated as an entrepreneurial business leader & early stage investor. Gaurav helped found & build two ecommerce businesses in India with Pearl (fashionandyou.com & dealsandyou.com). The online fashion and lifestyle industry was speeding up and catching its track in India. The moment came for Fashion&You when some private European & Indian investors showed interest in Fashion&You and invested certain amount in November 2009. The company got the initial funding. What a startup company expects other than the initial round of funding. They were lucky to get it and invested the fund to raise the technology and manpower. Soon they received second round of funding of $8 million from Sequoia Capital in December 2010. The confidence of the top management rose each day. They spent the fund on marketing of the brand. Soon, after a year from previous funding, the company received $40 million from Norwest Venture Partners and Intel Capital, in November 2011. These funds were invested on manpower and marketing the business. But soon after the funding was raised, something went wrong inside the company and Fashion&You witnessed a tragic downfall in its business which led the company to down of the stairs from its number 1 position in the ladies fashion retail industry. But the top management headed by Harish Bahl kept leading the company and around a year back, in June 2014, the company raised its Series D round of funding of $10 million from new and existing investors including Sequoia Capital, Smile Group, Norwest Venture Partners, Intel Capital and Nokia Growth Partners. The company used the funding amount on brand building and strengthening the technology. [su_box title=”More From DSIM :-” box_color=”#c7c7c7″ title_color=”#000000″ radius=”2″]1) One Big Mistake That Lead Startups To Wind Up Their Business…Utilization Of Limited Resources! 3) How Good Signup Pages Can Benefit Your Business: Illustrations! Though Fashionandamp;You lost a round of fight with its arch rivals but was still in the battle. The management led by non-other than Harish Bahl was determined to bale out Fashion&You from the mid-stream and deep mesh. Riding on the brand name and awareness, management decided to re-launch the website with additional category of products but without losing its soul. 1) FashionandandYou started from scratch, building a new motivated team. This saw change in marketing and logistics supply chain heads in the company. 2) FashionandYou have shed its image of selling selective brands. It just not only added different categories of products but also multiple brands to its websites. 3) Last year in June, FashionandYou received funding of $10 million hence operation became easier and they are returning on track through marketing. 4) With reachability to over 5.7 million members across 1200 locations, FashionandYou became the first choice for many burgeoning entrepreneurs. 5) Today, fashionandyou.com works with over 800 such entrepreneurs across categories and encourages talented and budding designers and suppliers to get their businesses online and reach out to millions of people nationwide. What FashionandYou is planning for its Future? The company wants to maintain the position of being the largest fashion retailer for women and continue to wow consumers through great selection and a superior consumer experience. Along with focus on technology and supply chain management, the company is planning to launch its Android app soon along with a refurbishment of the site. The online fashion and lifestyle industry is expected to grow to $15 billion by 2020. In this scenario, the company is expected to raise funds to establish itself as a well-known brand across the e-commerce industry and regain its No.1 position in Indian fashion e-commerce industry.